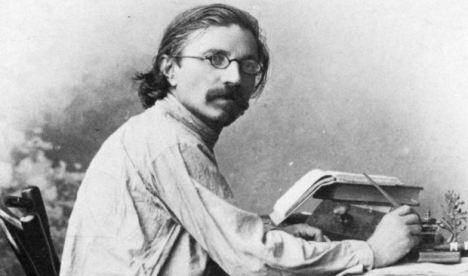 Shalom Aleichem: "Although realizing he's about to be put to death anyway, the bird-Jew played along with his executioner, still absurdly terrified of what might happen if he didn't." In his autobiography, legendary Yiddish author Shalom Aleichem recounts a harrowing story his grandfather had told him about "the bird-Jew." The squire, in a jovial mood, agreed to extend the agreement if Noah would climb the stable roof and pretend to be a bird  so he can shoot him. Fearful of angering the nobleman, Noah obsequiously did his bidding. He clambered up as ordered, bent forward, flung his arms sideways and assumed a birdlike pose. At that instant the squire fired and Noah fell, as any slain bird would. Although realizing he's about to be put to death anyway, the bird-Jew played along with his executioner, still absurdly terrified of what might happen if he didn't. This is the cringing mentality, the fear of giving offense to one's mortal enemies, which Zionism was established to eradicate. You can take the Jew out of the Diaspora, but not all the Diaspora out of all Jews. Israel's Left and its media mouthpieces are prime examples. To hear them, Prime Minister Binyamin Netanyahu has unpardonably angered the nobleman from the Oval Office. It was Netanyahu's duty to obediently assume the role of the bird-Jew and self-destruct to appease his boss. Of course there's the minor matter of the boss having been unfriendly to begin with  inimical in fact. But why quibble about sundry details? Who cares what came first  Netanyahu's effrontery or Obama's antagonism? From the Labor-Kadima perspective, it serves to present Netanyahu as the oafish bull in Obama's dainty china shop. According to the Buji Herzog/Tzipi Livni narrative, Obama harbors effusive good intentions toward Israel but Netanyahu upsets all of the president's compassionate predilections. The contention that Netanyahu disrupts Israel-US harmony has thus become a central campaign motif (second only to the earth-shattering issue of bottle-recycling at the PM's residence). Obama, it needs be stressed, is hardly loath to collaborate with Netanyahu's challengers. Indeed he does his darndest to hammer the message home to Israel's voting public, while simultaneously professing not to interfere in our electoral process. Hence Obama claims he's merely denying Netanyahu pre-election advantage by opposing his Congressional speech and refusing to invite him to the White House. Tendentious opinion-molders dutifully parrot his line and omit reference to telling precedents. Obama has anyhow never quite gone out of his way to welcome Netanyahu at his abode  long before the current righteous furor about addressing Congress. During Netanyahu's first-ever visit to the Obama White House in 2010, his surly host demonstratively walked out and left the Israeli guest embarrassingly alone. Obama gruffly announced he was "going to have dinner" with his family. Netanyahu wasn't offered a bite. It was an in-your-face protocol breach in which Obama appeared to take pride. Netanyahu, he let the watching world know, isn't his favorite interlocutor  not by a long shot. That's why Obama kept on taking potshots at Netanyahu in later encounters as well  most notably when the president made too obvious an effort to avoid a photo-op with his least desired guest. Obama had Netanyahu use the back door  like a pizza delivery boy. On that non-too-gracious occasion Netanyahu again wasn't so much as offered a glass of water, a fact of which the media was gloatingly apprised. We may be forgiven for considering these slights churlish and childish in the extreme. But they pale against Obama bellyaching to then-French President Nicholas Sarkozy (inadvertently before an open mic at the G-20 Cannes summit of 2011) about how "fed up" he was with "having to deal with" Netanyahu. In a more recent episode Netanyahu was disparaged as "chickenshit" by an "Administration official" that we were informed was "very close to the President." Obama never bothered to make nice although his failure to do so might conceivably inspire the inference that he didn't mind insulting the Israeli prime minister one bit, didn't mind the story getting out and was maybe even pleased as punch that it had. Bottom line  America's most anti-Israel president to date viscerally dislikes the man Israelis had elected to lead them. Now that another voting round is at hand, Obama can hardly claim to be disinterested, neutral and hands off. Therefore, the refusal to meet Netanyahu isn't a manifestation of impartiality. It's as a partial as it gets because Obama had received other foreign dignitaries in the midst of their countries' election seasons. By making Netanyahu a glaring exception, Obama underscores his odium and signals with offhand lack of subtlety whom he wouldn't like at Israel's helm. Nothing else matters  not even if boycotting Netanyahu backfires. Had he agreed to allow Netanyahu into the White House (even by the back door and with the intention of giving him the usual cold-shoulder reserved exclusively for the Jewish state's head of government) there would be no news item. Netanyahu would have been denied all the priceless publicity that paints him as a patriot defending his endangered country's existential interests. There's no escaping the impression that Obama  consumed with antipathy  wants Israel's electorate to understand unambiguously whom the American president wants knocked out in the current bout. This cannot be swept aside and pooh-poohed  not even if we choose to overlook the personal involvement on the Herzog/Livni side of American campaign consultants directly connected to Obama and even if we choose to overlook the bankrolling by American contributors of the anti-Netanyahu drive. The cynical pretense that this is non-interference flies in the face of common sense, especially when there's a long dishonorable history of very active American meddling in Israeli elections. What may have been restrained in Israel's earlier decades became brazen under Bill Clinton, who cheekily and cheerfully took sides without much attempt to cover his tracks. That was back in 1999 when Ehud Barak led Labor to a victory over incumbent Netanyahu, who was already then not exactly the administration's darling. That, incidentally, was the campaign in which many bogus non-profit organizations were employed by current Labor headliner Herzog to funnel illicit funds into Barak's campaign coffers. Herzog audaciously denied that this was illegal but the State Comptroller later ruled that "the greatest-ever electoral campaign scam" had been perpetrated. Clinton pulled out all stops in his barefaced intrusion into Israel's domestic politics  in a fashion unseen since the CIA's blatant interference in Italy's post-WWII election. Brashly, Clinton dispatched his own spin doctors, private pollsters and campaign strategists to boost Barak. They were greeted here with much fanfare by the crowing Left as persuasive testaments to the American president's preference. Since America is reputed to be our best bud, Labor openly boasted about Clinton's non-too-disguised endorsement. The subtext was that it behooves the Israeli voter to do as Washington requests. Clinton could hardly contain his glee after Labor's win. On the eve of Barak's first Washington visit as PM, the eager American host quipped that he's "as excited as a kid awaiting a new toy." It was pretty demeaning to look upon the leader of an allied independent state as a plaything but, with incomparable chutzpah and outrageous officiousness, Clinton made Barak's battle his own. Obama is even more partial and way more vindictive than Clinton but he lacks Slick Willie's flair. Instead, we are bullied by tactless threats about what might befall Israel should Netanyahu prevail. The by-now familiar "Administration official," who's "very close to the president," warns that Obama still has plenty of time left in office during which he could severely punish Netanyahu/Israel. In other words, the president cautions another country's voters against electing their notorious "chickenshit" again. Rather than be outraged by such crude imperiousness  as any Israeli ought be, his/her political orientation notwithstanding  our Left recycles the accusation that Netanyahu has irrevocably harmed Israel's relations with Obama, on whose goodwill our survival prospects presumably hinge. It's our duty to be servile. The last thing we can afford is to rile the scary squire from the West Wing. Therefore, it's exceedingly inadvisable to mention the squire's nettlesome pre-existing bias. It's political heresy to recall the irrefutable fact that Obama hasn't been remotely well-disposed toward Israel in the first place. Nonetheless, pesky skeptics might wonder whether the squire's persistent spitefulness can at all be mitigated. Can we really imagine no worse a scenario than vexing this hostile honcho? Is there altogether any point to refrain at any cost from displeasing someone who has consistently lost no opportunity to side with our genocidal enemies? Our slavish striving not to incur more wrath makes just about as much sense as it did for the two Jews in the following variation on the bird-Jew theme. These Jews faced a firing squad. One of them cursed the executioner who offered him a blindfold. The other was horrified and exclaimed in trepidation: "Why are you making him angry? You're going to get us killed!" A reader, wpapke, noted that "the only Israeli PM who will be welcomed by this administration is the who is willing to cooperate in the annihilation of Israel. "